Talk: "Physician Assisted Suicide and Euthanasia for People with Psychiatric Disorders: An Emerging Ethical Crisis"
In several European countries, physician assisted suicide and euthanasia by lethal injection are being made available to psychiatric patients with non-terminal mental illnesses – commonly administered by their own treating psychiatrists. Canada now offers euthanasia by injection for patients who are not strictly terminally ill, and the nation is on the verge of making it available to those with psychiatric disorders only. This raises profound ethical questions, for psychiatrists in particular, who have a core ethos and skill set to prevent suicide, find alternative paths to a better future, and help patients cope with and even make meaning of suffering. 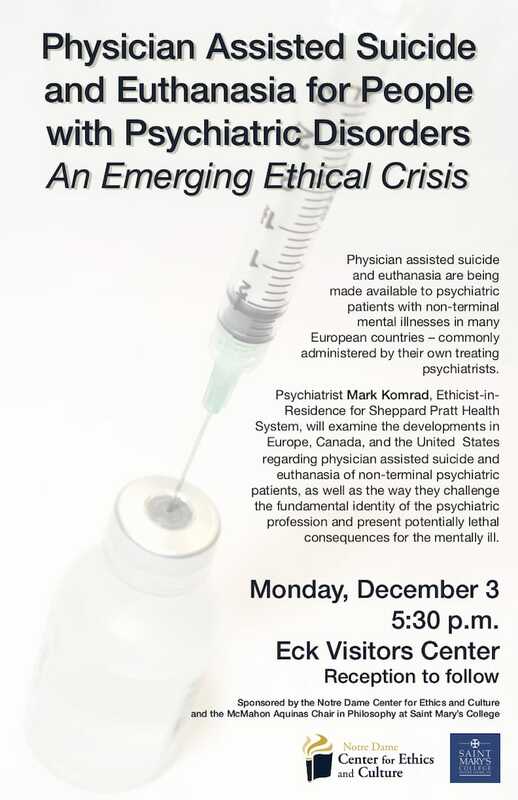 Psychiatrist Mark Komrad, Ethicist-in-Residence for Sheppard Pratt Health System, will examine the history of developments in Europe, Canada, and the United States regarding physician assisted suicide and euthanasia of non-terminal psychiatric patients, as well as the way these activities challenge the fundamental identity of the psychiatric profession and threaten to have dire consequences for the mentally ill.
Cosponsored by the the Edna and George McMahon Aquinas Chair in Philosophy at Saint Mary's College.